As the decades-old U.S. embargo of Cuba winds down, Americans are becoming aware of what an exciting art scene exists just 90 miles off our shores. 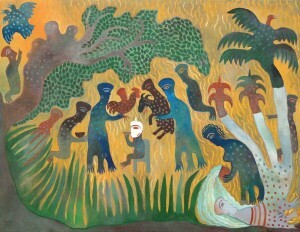 Manuel Mendive, Ofrenda (Offering), 2002, acrylic on canvas, 40 x 51 inches. Ruben Alpizar, From the series “My Ark II,” 2015, acrylic on wood, metal and plastic, 68 x 64 x 50 cm. Also paradoxical is the tremendous vitality of Cuban contemporary art. One might imagine that 50 years of Communist rule would have stifled creativity and freedom of expression, but the opposite is the case. Although propaganda and heroic images of Fidel Castro and other revolutionary leaders have been common themes of Cuban art, especially in the 1960s, on the whole the government has been far less controlling of artistic expression than the Soviets used to be. Just as important is the fact that the state supported the arts and subsidized artists. “One of first things the Cuban government did after the revolution was to build an incredible free art school,” says Sandra Levinson, a former journalist who runs the Center for Cuban Studies in New York and leads art tours of the country. “In Cuba they are very proud of their trained artists.” While many observers today associate Cuban art with “naïve,” self-taught, or folk expressions, in fact the country has a long tradition of formal instruction in academic art. The Academy of San Alejandro was founded in 1818 by a French painter, Jean Baptiste Vermay, and is still one of the island’s key arts institutions. 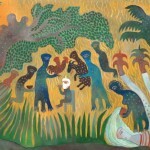 From Spanish and French influence during the 18th and 19th centuries to modernism during the early 20th, Cuban artists have been absorbing international influences and blending them with local culture to create a diverse, but uniquely Cuban, art. Contemporary Cuban art owes a lot to the Afro-Cuban modernism of painters such as Wifredo Lam and Eduardo Abela, but today’s artists are just as likely to work in mixed media, found materials, photography, and conceptual modes as in oil on canvas. The range of themes, concerns, techniques, and aesthetics is huge. Abel Barroso’s playful, text-emblazoned mechanical wooden constructions reflect on the consumerism and international tourism that are having an increasing impact on Cuba. 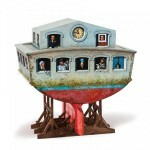 Kcho (Alexis Leyva) uses found objects to make large-scale sculptural works that riff on the image of the homemade boats that so many Cubans have used to flee the island for the U.S. Mabel Poblet’s mixed-media works, based on photographs, depict her own life, as refracted through a colorful, fantastic-cinematic sensibility. In Dayron Gonzalez’s figurative oil paintings, splotches of paint disturb the otherwise smooth renderings, imbuing ordinary-seeming scenes with eerie strangeness. Ruben Alpizar is a meticulous craftsman whose paintings are inspired by Old Master still lifes and religious allegories. Carlos Estevez creates timeless, non-perspectival paintings featuring symbolic figures interlaced with cosmological-looking skeins of stars, dots, and lines. He also makes marionettes that combine human anatomy with everyday objects like sewing apparatus or musical instruments. 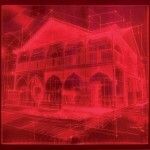 Assemblage artist William Perez works in etched plexiglass illuminated by colored lights; many of his objects depict the architectural legacy of Cuba, in which palatial, European-inspired buildings from the pre-revolutionary era are repurposed for occupancy by the working class. Dagoberto Driggs Dumois’ art also deal with the architectural legacy and industrial history of Cuba. He takes fragments of metal and wood from old sugar mills in his home town of Obin—a now-defunct sugar-refining center—and combines them into assemblages along with old photographs of the area printed on metal plates. Kadir Lopez makes his art out of discarded advertising signage from the pre-Castro period. The symbolic weight of history continues to have a major impact on Cuban art, despite a revolution that aimed to negate the past and restart the clock. Manuel Mendive, one of the most senior figures in Cuban art, has built his entire oeuvre on a foundation of Afro-Cuban history and religion. A priest of Santeria as well as a painter, Mendive depicts the rituals of this syncretistic Yoruba-descended faith in works such as Ofrenda (Offering), a vision of a world in which men mix with gods on a equal basis as nature envelops them all. Mendive’s dreamlike, tropically-tinted style may suggest folk art, but he is classically trained. He is also a performance artist who has choreographed Santeria-inspired dances in which he painted the dancers’ naked bodies with his trademark imagery, causing both consternation and wonder in his audience both in Cuba and in the U.S.
At the other end of the broad spectrum of Cuba’s cultural currents, photography and photo-based art have become especially popular among the generation of artists that came of age after the ’90s. “Photography has become a really important medium in Latin American art in general,” notes Couturier, “particularly since digital cameras. It used to be really expensive; now it’s democratic. I’ve noticed that painters who never really did any photography have started working with digital images.” One example he cites is Aimee Garcia, whose work blurs the line between painting and photography. Garcia’s moody, contemplative images explore the way in which one looks at oneself and is looked at by others. 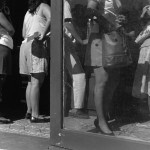 Cuban photographers are also continuing with “straight” approaches to the medium: Mario Algaze, born in Cuba but now living in the U.S., works in the tradition of black-and-white artistic photojournalism—whose most famous Cuban practitioner was Alberto Korda, Fidel’s longtime personal photographer—chronicling life across Latin America, including Cuba. Now, however, the message has finally gotten through, and Cuban art has new level of presence in this country. More dealers are showing it and making frequent trips to Cuba to find the best works. More Americans are attending the Havana Biennial, a showcase for the art of Cuba and the developing world in general, founded in 1984 and held not quite every two years since (the most recent was in May–June 2015). The U.S. has been granting Cuban artists long-term visas that allow them an unlimited number of visits over a 5- or 10-year period, and a good number of artists now divide their time between the two countries. According to Couturier, “half of Havana” was at this year’s Art Basel Miami Beach. Group exhibitions on both coasts have given new prominence to Cuban contemporary art in the past several years. These changes are great for the market, but they cause some longtime observers to wonder whether the go-go attitude will end up harming the artists and the art. Undoubtedly, some of the creative ferment in Cuba has been due to the island’s isolation, fraught political climate, and scarcity of resources. Despite the wealth flowing into the Cuban art world, artists still struggle with lack of materials and lack of access to the internet, but the way things are going, the situation will likely improve, sooner rather than later. Will that take away the specialness of Cuban art? Most observers think not. Cuba’s specialness is deeply embedded in its culture, dating back long before the revolution. “Historically, Cuba has always been very rich in culture,” says Couturier, “predominantly because it was a crossroads for travel between Europe and Mexico, Central America, South America. It was, per capita, the wealthiest country in the Western Hemisphere. They hired the best artists and architects.” Nance Frank, a Key West, Fla.-based dealer of Cuban art, says, “Cuba has been in a special, unusual position since the beginning. In the Spanish colonial era, they were the center of the Latin American art world. If you couldn’t afford to go to Paris, you went to Havana.” And then there’s Cuba’s sense of artistic community, fostered by the collectivist mentality of the Castro era. 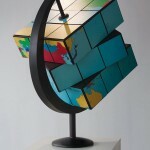 Art collectives such as Los Carpinteros (Marcelo Castillo and Dagoberto Rodriguez) and The-Merger (Alain Pino, Mayito, and Niels Moleiro) create work together without seeking to draw attention to individuals, prizing practice above personality in a manner reminiscent of the medieval guilds. And then there’s the legendary intensity and ambition of Cubans, national traits that will doubtless survive any political or economic change.